The South End is swarmed on weekends in the summer with visitors flocking to the neighborhood’s SoWa Market, an assembly of food and gift vendors, galleries, furniture stores and a beer and wine garden. While the popular event shuts down for the season at the end of October, it is returning this weekend to help all of us with our holiday shopping lists! It’s the same market – just with a little more holiday pep! Head to the SoWa Power Station on Harrison Avenue Saturday and Sunday for over 100 makers and specialty food vendors. Even the pickiest of your friends and family will adore one-of-a-kind creations from the SoWa Winter Festival. For those who live in the area (or those who just really want to festive up your hotel room), Stow Greenhouses will be on hand selling Christmas trees of various sizes. 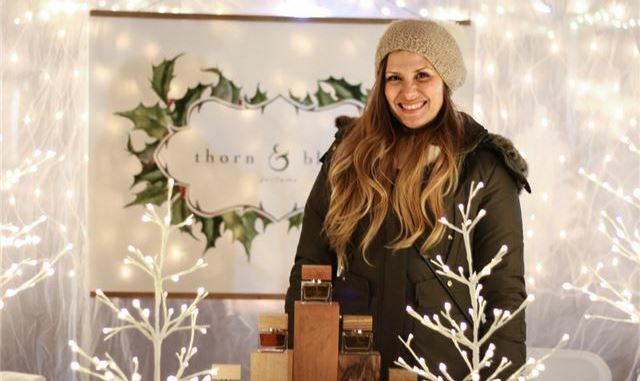 Wander to Thayer Street nearby at 450 Harrison Avenue for food trucks, shopping, live ice sculpting, galleries and artist studios, and a heated tent filled with live holiday music, mulled wine, and hot chocolate. The temperatures may be diving, but the fun is just heating up at SoWa! Photo courtesy of SoWa Market.